Progressive indie rock band Megosh premiered the official music video for their song “Body Works” on ARTISTdirect today. The song is off their new EP of the same name that was released via Revival Recordings and is available on iTunes. The video was directed by Justin Reich and the song (and whole EP) was produced by Shawn Milke guitarist/vocalist for Alesana and owner of Revival Recordings. 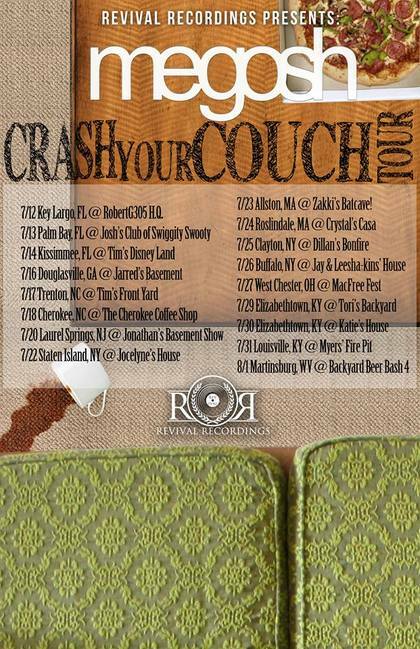 Megosh are currently on the “Crash Your Couch Tour” with The Dear Hunter…sort of. The unique concept involves Megosh following The Dear Hunter’s tour around the East coast and Midwest, where they will perform for fans as they wait in line. Rumor has it there will be some extra surprises, as well. After the show(s), Megosh will perform intimate acoustic sets in the homes of fans. Progressive indie rock band Megosh premiered the official music video for their song “Body Works”. The song is off their new EP of the same name that was released via Revival Recordings and is available on iTunes. The video was directed by Justin Reich and the song (and whole EP) was produced by Shawn Milke guitarist/vocalist for Alesana and owner of Revival Recordings.